I would like to send some to my mom. I love the Country Beauty Bouquet! I would love to (and will anyway) send a bouquet to my grandmother. She has been a gardener most of her life. As she slows with age, I know how seeing beautifully painted blooms make her happy. I would love to surprise my mom and bestest friend with these! My mom is having her second knee replacement surgery soon and this would be so wonderful to win for her! I’d love to win, but this is a good reminder to start thinking of gifts for this special day! I’d love to send flowers to my sister. I would like to send flowers to my wife! I’d like the Lavender Wishes Flower Arrangement for myself and one for my God Mother. I would love to send one of these lovely bouquets to my mom! I would love to send the flowers to my amazing mom. They have such beautiful arrangements! I love the Wildflower in Flight bouquet! Another of these flowers above are beautiful and I would love for my own mother to have them for mother’s day. Perfect colors. My mother passed away in January and since then my cousin has been tending to my elderly father and disabled brother. She’s simply amazing. I’d love to send her a bouquet. I love the Tulip arrangements. I would love this for my mom for her bday and mother’s day. My mom would love the Teleflora’s All Eyes On You Bouquet. Zen Artistry is so pretty! I’d like to send flowers to my daughter.. I would love to send them to my mom. She has done so much for me and my sister. I really love the all eyes on you bouquet. plus its her favorite colors! Hello, my mother would love these… she’s always been so tough, but just came down with pneumonia which is taking a while to shake off. On top of that she’s caring for her mother and aunt in her own home. She deserves this! I really like the Teleflora’s Desert Sunrise Bouquet and Happy Hydrangea Potted Plant in Blue. I would love to send some to my mom. I’d send it to my mother. She loves flowers. I like the Teleflora’s Wildflower In Flight Bouquet. I would send yellow roses to my grandmother. I would like to send flowers to my wife, because she is special. I would definitely send them to my Mommy! I would love to send the Spring Speckle bouquet to my mom! I’d like to send the Wildflowers in Flight bouquet to my daughter. I would send flowers to my mother in law. i’d love to send the Teleflora’s Country Beauty Bouquet to my mom! That vase is great! I would send these to my wonderful mom. I would give this beautiful flowers to my daughter. Her son has no money to buy anything. I would love to send a special piece to my mom for Mother’s Day. She likes living pieces so something like Teleflora’s Living Love Garden or Garden To Go Basket would be nice. To my sister.She’s the best. I would love to send my Mom the Wildflower In Flight Bouquet! I’m sure she would love that one. My favorite Teleflora bouquet is the Imagination Blooms with Cymbidium Orchids. I’d like to send flowers to the mothers of my wonderful grandchildren. My husband & I mother’s have passed on and in heaven. We took care of my husband’s mom battling Parkinson’s in our home for 8 years and my mom battling lung cancer. I would love any of these beautiful bouquets 💐 for myself who is a mom herself. I would love to send flowers to my daughter. She is such a hard worker and a great mom. I would send to mom for mother’s day. I would love to send flowers to my mom. she deserves to be pampered. I’d send a bouquet to my mom and sister. I love the arrangement with the butterfly vase. My grandmother would adore these. I would send my mom some! I sent her some last year and she loved them! Purple flowers are her fav. I’d send flowers to my mom! Thanks! i would send these to my sister. her being a single mom she is definitely under appreciated and i bet would love some flowers. I’d love to send flowers to my mom She lives across the country from me and i’d love to surprise her with these! I would send flowers to my mom, I love the flowers with the green vase, very pretty. I would like to send flowers to my mom. I’d love to send them to my mom. She lives far away and I’m not sure if I’ll be able to go and see her. I would love to send flowers to my mother. The flowers that I would like to send: Teleflora’s All Eyes On You Bouquet. I would actually have friends nominate to send them to a single mom. My mom would love them, but / I know there are some hard working single moms out there that would appreciate them. They’d go to my mother. I would like to send flowers to my lively 92 year old Aunt Nita. I would love to send some flowers to my sister-in-law, she has had a really ruff time and I would love to brighten her day. The All Eyes On You Bouquet is absolutely gorgeous! I would give it to my mom. I like Teleflora’s Gorgeous Gratitude Bouquet. I would like to send my 89-year-old foster mom some nice flowers for Mother’s day. I went to live with her when I was 16, I’m now 61 and she has kept in touch with me for the last 45 years! I’d love to give one to my Mom. She loves smiley faces so I’d love to give her the Teleflora’s Be Happy® Bouquet with Roses. I would definitely give the flowers to my mom. She loves flowers so this would make her day. would love to send them to my sister-she deserves a nice surprise! I would send flowers to my older sister, who became our mother-like person after our mom died years ago. I would like to send the Teleflora’s Desert Sunrise Bouquet to my mom. My Mom is not crazy about flowers (expensive, don’t last long), so I would send them to a special little Angel in my life…a little girl I used to babysit and still keep in contact with. I would probably send her a big bouquet of carnations, daisies, and roses. I’d surprise my grandma with flowers. We live in different states – and this will be her first Mother’s Day since we lost Grandpa, so I think she may need an extra smile! My mom would love the vase with the bee on it! Flowers are always a great Mothers Day gift! I definitely would send a bouquet of teleflora flowers to my mom. She loves roses and daisies so one of those would be great and the dragonfly vase is so pretty! To my wonderful mom, of course! I would send flowers to my mom! I would have loved to have sent these to my mom, but she passed almost 3 years ago. So, I would send them to my sister, who is one of my best friends and who works hard and deserves something beautiful in her life! I would send these to my mother who could use them and get a second smaller one for my grandmothers grave. My aunt who lives alone in Texas! She deserves it. I would love to send them to my mom. She loves fresh flowers. I like the Zen Artistry arrangement. I would like to send flowers to my mom this mothers day! I’d love to leave my friend some flowers, first mother’s day without her husband at her side. I’d love to send flowers to my 97-year-old “aunt”! I would love to sent any of the beautiful boquets that you shared with my mother. I would love to send my aunt flowers. She lives in Arizona. I’d like to send flowers to Mom, back in N.Y. She’s in a care facility now, doesn’t see many visitors and too far for me to visit. She’s 92 already! I’d send them to my grandma! I’d send something with the hummingbird design to my mom. My grandparents always loved them. I would send Teleflora’s Winged Beauty Bouquet to my amazing mother in law. I love he zen artistry because it’s something they can keep for a long time and it’s beautiful. These flowers are all beautiful! anything with yellow roses i would love! thanks for the chance, would definitely be a great pick me up for my Mom! I would love to send my wonderful Mom the Teleflora’s Heart’s Pirouette Bouquet. She would love it. I would love to buy my mom a beautiful Teleflora bouquet this mother’s day! I would love to send the Winged Beauty Bouquet to my mother for Mother’s Day! I would send flowers (or, more likely, a potted plant) to my honorary aunt, who lives far away and whom I miss dearly. I would like to send flowers to my Mother and my Mother-in-Law for Mother’s Day. I’d give these to my momma! I plan on sending flowers to my mother in law! I know she has to work on mothers day, so I plan on sending them to her job. I know she’ll love them! I would like to send the Lavender Chiffon Bouquet to my Dad’s friend Alma. Shes been so good for my Dad since Mom died years ago. I love sending beautiful flowers to my beautiful mother. My favorite are arrangements of a variety of different flowers. my mom and we love any type of roses! I would send roses to my mom. Oh I would love to send the Teleflora’s Gorgeous Gratitude Bouquet to my mom for Mothers day! We raise monarchs in the summer months, and she is such a huge help! She would love it! My mom would be so overjoyed to get flowers- she really deserves them! I would love to send a bouquet to my mom on mother’s day. I would love to send some type of flowers to my mother for Mother’s Day. I don’t have a favorite bouquet. love to have it for myself. my mom passed 5 years ago . it will be hard again at mothers day and her not being here to be with her and celebrate. i love any flowers. they are beautiful like my mother. I like the country beauty bqt. I might send these to my sis. I would send flowers to my grandmother who is in a nursing home. I would love to send some flowers to my sister, she has been having a stressful life lately and could use a little pick-me-up ! I would love to send flowers to my mom, and my sister. I would send my Mom flowers. I like the Teleflora’s Enchanted Cottage bouquet. I would love to send one to my Mother in law. She lives so far away and we rarely get to see her. I want her to know how much we love her and think about her. The roses are beautiful,just like my wife!!! I would love to send this to my neighbor who went to live in a nursing home a little over a year ago. I want to send my mom some flowers or a plant – her birthday is 4-28 and then of course there is mother’s day too. I haven’t been able to visit in a couple of years because we live far away from each other. I would love to send flowers to my mother in law this mothers day. She is pretty awesome and she loves flowers. I would keep them for my home. My house could use some inspiration! I would like to send flowers to my mom of course, and my aunt. I would like to send flowers to my Daughter-in-law. She has a new baby, three other children and a full time job. I know that is the normal nowdays but she does a great job. I like any bouquet is any with carnations and roses. I would like those for myself! 🙂 My mother passed away a few years ago and this would be nice to remember her by. Thanks for the giveaway! I would love to send flowers to my sister. She’s having a hard time right now. I am extremely grateful that my Mother is still here so she is definitely my choice to send flowers to. She taught me a lot about flowers and how to care for them and I know she would love the Country Beauty Bouquet. She is a country girl at heart and the ivy is a special touch. my mom would absolutely love this! I would send flowers to my mom. I’d send flowers to myself,because my mother has passed and my kids can’t afford to send them to me. Teleflora’s Gorgeous Gratitude Bouquet is my favorite. I would send the Bouquet Teleflora’s All Eyes On You Bouquet to my mother. I would send them to my Mom she is 81 this year so thankful to still have her. The Winged Beauty bouquet looks best. I would send to my sister, she is a wonderful Mom. I would love to send them to my niece, a new mom this year! I would love to send my grandma a Country Beauty Bouquet. Thanks. I would send them to my step mom! I’d split it between my mom and my Nana. I would love to send my mother the Teleflora’s Wildflower In Flight Bouquet for Mothers day. So beautiful! I would send flowers to a sick friend. I want to send this to my Mom! I would love to win flowers for my mother! She loves anything bright! I would send flowers to my mom this Mother’s Day. I would give them to my oldest daughter. Thank you for the chance. i would love to win to gift my mother a bouquet of beautiful flowers from Teleflora to shows her much I appreciate everything she has done for me starting with giving me life and bringing me into this world! i love all Teleflora arrangements and I know she would be happy with all of them! I’m already taking my mom on vacation to Punta Cana, finishing up with a box of chocolates on return, flowers would be the ultimate boost making it a great time. My mom passed away this year so I would send flowers to my daughter who has had a very bad year this year and deserves to be treated special! Her favorite would be roses! Thanks for the chance to win! I would love to send flowers to my little sister for Mother’s Day this year. She is a first time mom and this will be her first Mother’s Day so it’s really special to her. I would send a giant budle of carnations, pink, red and white to myself. This has been a difficult year. I would love to send my Mom flowers for Mother’s Day! I’d love to send the Teleflora’s Wildflower In Flight Bouquet to my mom! My mother passed away in 2014 and I miss her. I would love some flowers to take to her graveside. 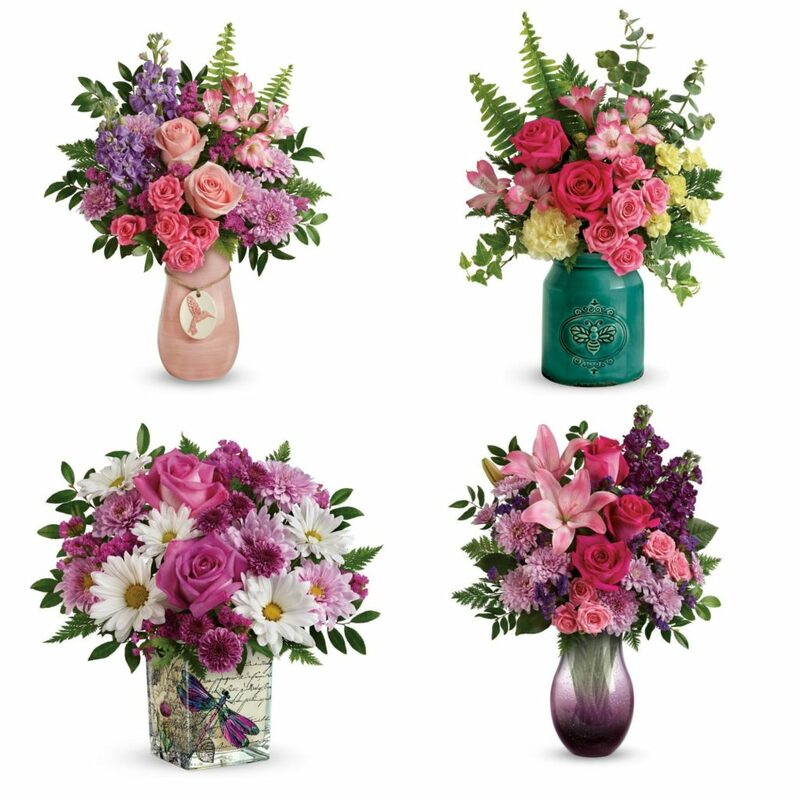 I would love to send it to my mom and my favorite is the Teleflora’s All Eyes On You Bouquet ! I’d like to send flowers to my mom. I think she’d really love the Citrus Smiles Bouquet, it’s got all her favorite colors. Thanks! So many beautiful creations to choose from. She would be so surprised and happy and absolutely desrves them. Thank you for this opportunity. I like Teleflora’s Living Love Garden and Teleflora’s Country Beauty Bouquet. We always get some for my mother-in-law. I love the Victorian Elegance bouquet! I’d love to send an arrangement to my 98 year old Aunt. She’s just like a Mom to me and a Grandma to my kids. Plus, she really loves flowers and I know she’d be thrilled. Thanks so much. I’d love to gift this to my mom! I like the Zen Artistry arrangement for myself. I really like the Teleflora’s Desert Sunrise Bouquet. I know the perfect mother-in-law, who at 91, would LOVE receiving one of these arrangements! I would love to send my aunt Sally a nice bouquet of flowers for Mother’s Day. I would like to send the Heart’s Pirouette Bouquet to my Mom. I would send it to my Mother, she loves tulips! I would like to send them to my daughter for being a great Mom to my 1 month old grandson. I send them to my mom. She loves carnations. I would love to send flowers to my mom, I know it would make her very happy and let her know we are thinking about her. I would love to send the All eyes on You bouquet to my mom! For Mother’s Day, I would love to send the orchid bouquet. That is her favorite flower. I would love to send my mom the Gorgeous Gratitude bouquet. She would really love how colorful it is. We’re hosting a Mother’s Day brunch so I would love a beautiful bouquet or arrangement for the table! i would send flowers to my mom. she is the best. I’d like to send my mother the, “Teleflora’s Wildflower In Flight Bouquet”, if I won. She’s in a care facility back in N.Y. now and we won’t be able to visit. I would love to send flowers to my wonderful wife Wendy. I heart the bouquet Radiant Reflections! I would send a bouquet to my daughter. She is mama to the cutest little puppygirl! I really love the Teleflora’s Wildflower In Flight Bouquet! We lost our mom some years ago, so i am going to send flowers to my girls. I would love to send flowers to my mother-in-law. I would love to send some flowers to my mother-in-law. I would love to send this to my mama! I’d like to send flowers to my Mom for Mother;s Day. Me and my hubby’s parents have all passed away to Heaven, but we have “adopted” and elderly woman in Canada as our “mother”…so it’d be nice to send her some flowers. Thanks and God bless! I love the Wildflower in Flight. I would love to give this bouquet to my aunt. My mom passed away ten years ago and since then, my aunt has stepped in as the motherly figure to me and my daughter. Holidays and celebrations, she is there. I would love to send flowers to my grandmother. I would send the All Eyes On You arrangement to my mother for Mother’s Day! I’d like to send flowers to my best friend – she raised 4 sons & is now raising a son she adopted and sh’es also raising her Grandson. She is wonderful! I would love them for myself. My favorite is the Teleflora’s Young At Heart Bouquet. I would love to send flowers to my step mom. I couldn’t have made it through my teen years without her. Even though her marriage to my dad did not work out, she has been a precious part of my life ever since. I would love to send this https://www.teleflora.com/bouquet/telefloras-wildflower-in-flight-bouquet?prodID=P_T18M400A&skuId=T18M400A beautiful bouquet to my lovely mom. Thanks for the wonderful chance 🙂 very generous! I would love to send some flowers to my bestie. She definitely deserves a pick me up this Mother’s Day! Since I am the one who would likely receive flowers from my family, I really like the Wildflower in Flight arrangement. Now all I have to do is let someone know about it! I will be sending flowers to my Mom on Mother’s Day. I would love to send a bouquet, any bouquet, to my mom. She would appreciate receiving fresh flowers. I would like to give my daughter in law some flowers for being a new mother. I would love to be able to send my mother a wonderfully beautiful Teleflora bouquet this mother’s day! Thank you for the chance! I would like to send flowers to my mom and my mother in law. Fresh flowers are the BEST! I would give this to my wife! She would like it. I like the Teleflora’s All Eyes On You Bouquet. I would like to give these to my daughter. I would send the flowers to my sister since I haven’t seen her in over a year. I would love to send flowers to my wife this Mother’s Day. I would love to send flowers to my sister. I would send some to my bestie/SIL. She is going through a divorce. I’d love to send flowers to my mom. I would like to send my mom flowers and my favorite is the Teleflora’s All Eyes On You Bouquet. I would love to be able to send my Mom flowers this Mother’s Day! She is awesome and would give someone the shirt off their back if they needed it. Thank you so much for the chance to win!! Love the rich purples in the All Eyes on You bouquet. I’d love to win it for my Mom! i would send flowers to my dear mom. I want to gift the flowers to my mother for all her sacrifices. My favorite is the all eyes on you bouquet! I would send flowers to my mother in law. She works tirelessly and always has time for her kids and grandkids! I would send my mother flowers. She loves gardening, flowers. Would love to send to my best friend, one of the best moms I know. I love their beautiful bouquets. If I could afford it, I would send my mother the Make Me Blush bouquet, which is a dozen Long Stemmed Pink Roses. She would love it. Thanks! I would love to send these to mom! I would no doubt send flowers to my mom. She’d be so surprised and happy. I would love to send my mom a bouquet of travel flowers this Mother’s Day. I would love to send my sweet mom some beautiful flowers for Mother’s Day. I would send flowers to my grandma, they would brighten her day. Would send flowers to my mother. She would like the Teleflora’s Heart’s Pirouet Bouquet. I would love to send my mom flowers! She would love any of the bouquets! I”d send the flowers to my mom. My mom’s birthday is this month, so I would choose some bright flowers for her. I would like to send flowers to my nana. She loves fresh flowers! I love the Teleflora’s Pleasing Purple Bouquet. Purple is my favorite color. Since my mom is gone, I would send them to myself. Would love to send them to my mom in Heaven. I would send my Mom Teleflora’s All Eyes On You Bouquet. I think it’s gorgeous, and she deserves something beautiful this Mother’s Day. Thank you for the chance to win! I’d love to send a bouquet to my mom! I would send flowers to my grandma. My grandpa passed away last June so this will be the first mother’s day without him. I would give these lovely flowers to my daughter who doesn’t have much. I would love to send them to my mom! Sadly, my mom recently passed, but another amazing woman knmy life would love and deserve these! I would love to send my aunt and sister in-law a bouquet this year for their special day. I’d send flowers to my mom, my mother in-law, and my wife. They all like stargazer lilies, so a bouquet with those would be nice. I would love to give my mom the Teleflora Wildflowers in Flight bouquet!